Canada has found itself caught in the middle of a feud between the United States and Mexico. Relations between the two countries have been strained since US President Donald Trump said he intends to build a wall along the US-Mexico border. The US is Canada's number-one trading partner, with Mexico a far second. That leaves Canada struggling to balance its need to stay on America's good side with its desire to grow its ties with Mexico. 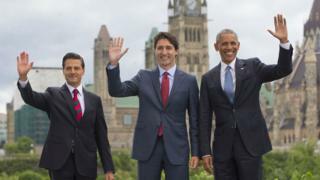 When asked if he would get involved, Canada Prime Minister Justin Trudeau reiterated his country's close ties with the US and avoided coming to Mexico's defence. "In any discussions and negotiations, there are moments when things go well and there are moments when things are a little more challenging," Mr Trudeau said. The spat between the US and Mexico comes at a tense time for all three countries, as Mr Trump has made it clear renegotiating Nafta, the trade agreement between the three countries, is a top priority. In 2015, trade between Mexico and Canada totalled about Canadian $38bn ($29bn US, £23bn). But that pales in comparison to Canada's relationship with its number one trade partner, the US. In 2015, trade between America and its neighbour to the north totalled $685bn. Although all three countries are part of Nafta, most of Mr Trump's attention has been focused on Mexico's border and manufacturing sector. As one of his first acts as president, Mr Trump ordered a wall to be built along the Mexico border, which is estimated to cost $12bn (£9.5bn, $15.7bn Canadian). In response, Mexico President Enrique Pena Nieto cancelled his trip to Washington DC. Meanwhile, Mr Trump has largely left Canada alone. "The administration has made it very clear, both to us and publicly, that they are not overly preoccupied with Canada in terms of much of their protectionism and much of the rhetoric they've put out," Mr Trudeau said. But just because Mr Trump is looking the other way now, does not mean Canada can afford to sit on the sidelines in this dispute, experts warn. "It's just a matter of time before this administration turns its eyes towards Canada," Agustin Barrios Gomez, a former Mexican congressman, told the CBC. "[Trump] will find some excuse to turn on Canada,"
Canada should no longer assume it's relationship with the US is business-as-usual, says Carlo Dade, director of trade and investment policy at the Canada West Foundation. A few months ago, Mr Dade said he attended a meeting in Dallas, Texas, with George W Bush. The former president tried to persuade Canadian and Mexican trade experts that "Trump would change" his tune on Nafta. Boy was he wrong, Mr Dade told the BBC. "The old paradigms for how the US government and administration functioned have completely been turned on their heads," he told the BBC. Colin Robertson, a former Canadian diplomat and fellow at the Canadian Global Affairs Institute, said that publicly, Canada must walk a "fine line" between being Mexico's ally and putting itself in Mr Trump's crosshairs. But privately, the government can "recognise the strategic importance of Mexico longer term, but also find its own way with the Trump administration" he told the BBC. In December, Canada lifted the visa requirement on Mexicans visiting Canada. Mexico has also been a key player in the Trans-Pacific Partnership trade deal (TPP). With the US now out of TPP, this could leave a spot open for Canada to shine, Mr Robertson suggested. But there has been one bright spot for Mexico-Canada relations recently. Last Friday, Canada's iconic coffee chain Tim Hortons announced it would be expanding into Mexico. Isolationism not a solution - Mexican PM Enrique Pena Nieto.